On a campus with 40,000 students, it’s too big of an issue to ignore. Penn State is a community of incredibly diverse people, and each one of us facing different internal obstacles. Our society looks at mental illness as a sign of incompetence and unintelligence, and we have been raised to make fun of those who openly admit to having struggles. 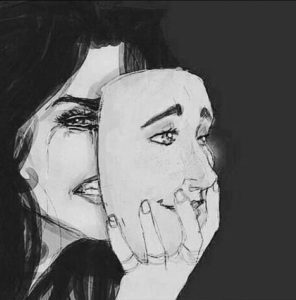 As we wrestle with living on our own, making decisions about our life’s path, and dealing with our own issues, we are forced to paste on a smile and pretend to be happy because we have learned that anything else makes us targets for ridicule. We as students need to start living our realities, and dealing openly with our mental illnesses. I have battled crippling anxiety for most of my life, and I no longer have the energy to hide it. 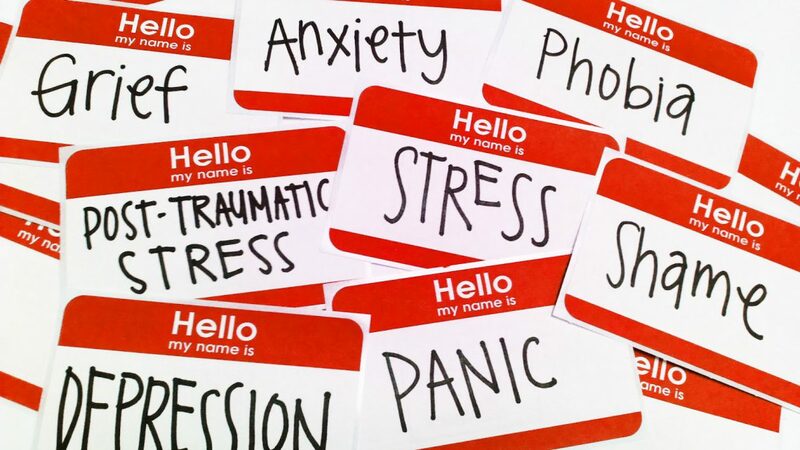 Mental illnesses like eating disorders, depression, and mood conditions are rampant on college campuses, and I know I am not the only one who is afraid of expressing what I am really dealing with. Making fun of people with struggles only exacerbates the problem, and has created one of the biggest issues of discrimination that teenagers face today. So what can we do about it? How do we combat the voices that tell us we’re weak for having depression, that we’re attention-seeking for having a mood disorder, that we’re stupid for being anxious? What can we as Penn Staters do? Well, we can talk about it for starters. 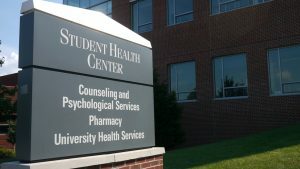 CAPS, Penn State’s Counseling and Psychological Services, is providing us with the opportunity to be open about our personal struggles. In addition to one on one counseling for students, CAPS offers public group discussions to help students openly invest in their mental health. 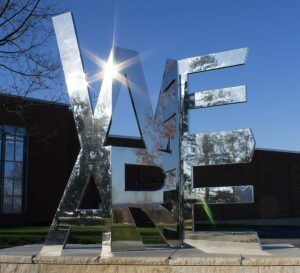 By establishing a community where we can speak candidly about the obstacles we face, Penn State can become a more supportive campus that allows its students to deal with their lives honestly, without pretending to be problem-free. Addressing the issue is the first step towards resolving it, and it’s incredibly important that we as students get involved in opportunities like this, not only to help ourselves, but to help our peers as well. As prevalent as mental illness is, it’s time for us to start acknowledging the issues people face. When childhood bullying becomes adult harassment, we need to stand up against the voices of ridicule and become a community that supports its students. 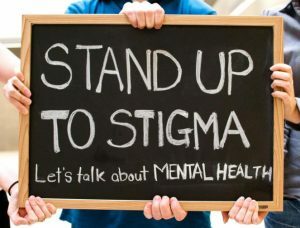 By talking openly about our struggles, and showing willingness to listen to and help our peers, we can challenge our society’s warped perspective of mental illness. WE ARE a community made of all kinds of people with all kinds of problems, and together we can commit to adopting strategies to make our campus a healthier place. We need to address the elephant in the room. This elephant wears a white sheet and carries a flaming torch, but it also wears a business suit and teaches children a whitewashed view of history. White supremacy is rampant in our culture, and it’s about time that our campus addresses the very real issue that racism presents today. Last night I attended a panel discussion discussing racism and white supremacy following the events in Charlottesville, VA last month. I was anxious to go, as I hadn’t had the opportunity to be part of a forum like this before. I left the Pattee Library two hours later in an almost trance-like state of awe; it was one of the most incredible experiences of my life. Six professors talked to us, answering our questions and giving me a whole new understanding of how racism pervades everyday American life. 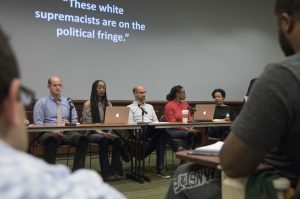 I could go on forever about the discussion last night, but for time’s sake I’ll leave you the link to the Daily Collegian’s review of the panel here. What I want to talk about today is what we as students can do to stand up to racism on campus. Dr. Jeanine Staples introduced a way of tackling the issue of white supremacy in a way I had never thought of before. She explained how macroaggressions (like the events of Charlottesville) bring global attention to the problem, but that microaggressions, the subtle everyday ways that racism pervades our society, are what allow white supremacy to flourish. She challenged us to look critically at the world we live in, and find ways in which white-bias affects our culture. For us that means reading our history books with the knowledge that its white authors may be telling only one side of the story. The most important point made at the panel last night, and the most relevant for us as college students, is that we make the difference. If we see discrimination on campus, we can create a movement to oppose it. The panel did concede that standing up to prejudice is extremely difficult, and often unsuccessful, but it’s our moral duty to fight for racial equality. 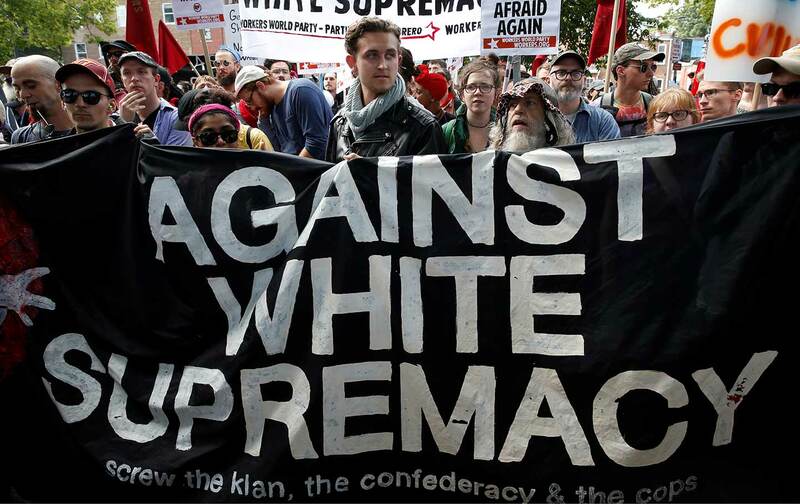 Our slogan WE ARE is founded in the idea of racial equality, and it’s up to us to oppose racism and actively fight for a better reality.